Mumbai based Anshula Technological Engineering Consultants(ATEC) is the brainchild of by Trinetra Bajpai, a Chemical Engineer Technocrat with over 46 years of experience in top executive positions in manufacturing industry with specialisation in design, engineering, execution and management of large-scale Petrochemical and other industrial sectors. 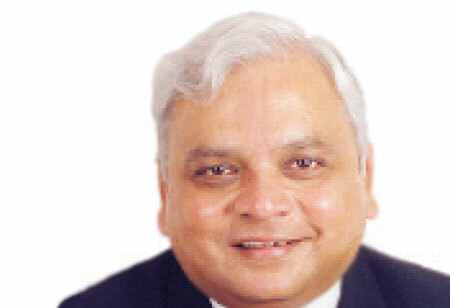 Mr.Bajpai has developed, perfected and successfully commercialized numerous chemical projects and technologies in course of a four decades plus distinguished career. After being the Project Manager of India’s first Bombay High Gas based Super Thal Fertilizer Plant of M/S Rashtriya Chemicals and Fertilizers(RCF)and with numerous other successful Projects under his belt, Mr. Bajpai successfully founded, established and operated several prestigious world scale organizations in Madinat Al – Sinaiyah Al – Jubail(Al –Jubail Industrial City). In his initial career spanning the period 1972 to 2005, he acquired vast domestic ∫ernational experience of world scale Ammonia, Methanol and Formal dehyde/Derivatives’ Projects` execution and setting-up state-of-the-art steel rolling mills and cutting-edge technology-based wood sector projects. The enviable track record of continuous success on international stage buoyed him to branch off on his own by setting-up a unique technological licensing, basic design, detailed engineering, equipment – machinery - materials supply, turn-key project management outfit. A close friend & mentor Jorgen Damgaard Jakobsen was instrumental in inspiring and encouraging him on to take the plunge. It was a calculated risk which paid off. This marked the beginning of ATEC. structured growth strategy.“Our KSF are a highly dedicated, experienced and loyal management base, our unique positioning as a One Stop Shopping Centre for a plethora of projects related capabilities specially in the Petrochemical field sector, immaculate reputation of a highly successful previous track records plus customer contacts and a customer friendly approach,” speaks Mr. Bajpai.
" ATEC has carefully diversified into other domains of activities under the umbrella of Bajpai Group of Companies of which ATEC is the flagship organization"
he company tasted success with their first project for M/S Mangalore Chemicals and Fertilizers(MCF). Over the years, they have strived to deliver efficient technical, energy, safety audits and turn-around maintenance supervision & training services. This amplifies ATEC’s capability in providing post commissioning and post project services to help customers achieve sustained productive operations over extended period of times. Currently, ATEC has carefully diversified into other domains of activities under the umbrella of Bajpai Group of Companies of which ATEC is the flagship organization. The other diversified Companies include KMPL, SATEX and KAT Music. Catering its range of services to the target audience in the Hydrocarbon Processing/ Petrochemical Sectors, one of the major aspects of the marketing strategy ATEC follows is offering the entire gamut of project related activities from Concept to Commissioning. “We identify, conceive / conceptualize and execute under a single point responsibility unlike some other players in the field who offer selective services ostensibly due to lack of versatility,” mentions Mr. Bajpai. This has helped their customers to acquire a long term sustained productive operations, simplified yet cutting edge process operations technology backed up by well-defined trouble shooting, assurance of product quality, adherence to consumption norms and bank able marketing inputs, among others. ATEC has recorded a progressive growth progressively over the 12 years of its existence attaining a CAGR of 6 percent and above. Further, the company has set its footprints in Saudi Arabia, Oman, Iran, Egypt, Italy, Brunei, China, Poland, Nigeria, Uzbekistan and Turkmenistan. For the years to come, ATEC has carefully sculpted well-structured plans to exploit the immense growth potential in the engineering sector.